Well, one of the heavy rains last week swept my trash can down the street and I have yet to find it. Sort of makes me think I shouldn't be surprised if I see an ark floating down the street in the next downpour. I have no recent memory of a summer that has been as wet as this one. I hope you are staying dry this summer because I'm certainly not! There has been a little bit of stitching going on since my last post but not as much as I would like to have gotten done. I needed a few red, white, and blue threads in my life over the last week or two so I started my Melissa Shirley canvas with the little boy holding the Flag. I am using a stitch guide by Carolyn Hedge Baird. This time last year I stitched Melissa's little girl with the watermelon slice. You can see her photo over to the right side of the blog. Both canvases are from a series that Melissa Shirley put out about three or four years ago. 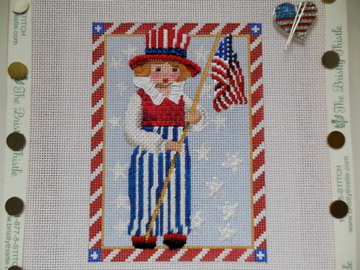 I'm working on the stars this weekend and may start putting in some of the diagonal stripes in the background, too. Such a fun, small project! 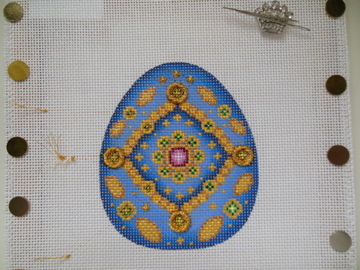 Egg #10 - the blue egg with the green gems - is another current work in progress. 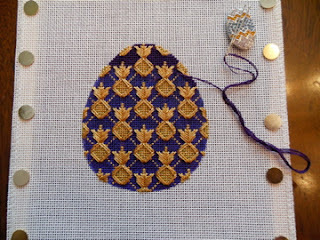 Stitching 4 Jessicas is the extent of my progress on this egg - but it's a start! I had a very enjoyable July 4th weekend in Jacksonville with Andrew and Anna. It seemed like a short visit but it was wonderful as always to be with them. I hope you all enjoyed your holiday weekend as well! Mother Nature has slowly been easing us into Summer this year with lots of rain, cool mornings, and moderately warm daytime temperatures. By this time last year, we had already seen some temps over 100 and this year we haven't even come close to those scorching temps. It's been wonderful! There hasn't been a lot of stitching done in the last couple of weeks. Between work and some sort of injury to my shoulder, stitching just hasn't been at the top of my list. After a visit to the chiropractor at the beginning of last week, my shoulder is feeling better but still not up to stitching using the floor frame. I'm hoping another visit to the doctor tomorrow for an adjustment will get the shoulder back to normal. At first, I was concerned that the rotator cuff was involved but since there was an immediate improvement after the adjustment, I'm less worried about a more serious problem. This week I finally finished the gold work on the 9th egg in the From Russia with Love series. These month-long projects are so satisfying! Signing up for this club was one of the best stitching decisions I made last year. 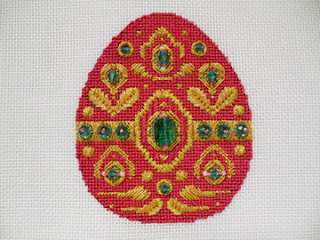 The main feature of this particular egg is the beautiful gold work. 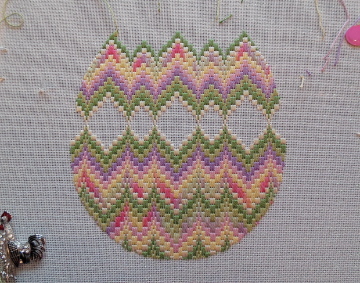 The background is stitched in Neon Rays using the basketweave stitch. The gems are turquoise colored. Kit # 10 has already arrived and looks to be another beautiful project. My shoulder problem brought a halt to any progress on my Tudors Home Study project. I look forward to picking it back up again. 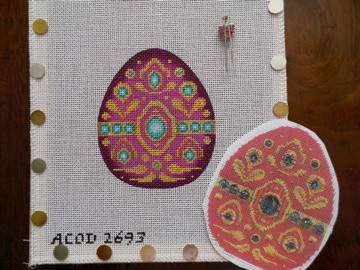 Amy has given us some challenges with this piece but that's how we grow as stitchers. 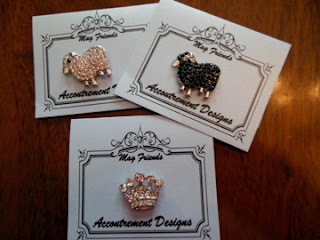 I'll show pictures soon of my Catherine of Aragon section. My posts this summer will be sporadic so don't be surprised if a few weeks go by and you don't hear from me. This time of year I spend so many hours a day on my work computer that when the weekend rolls around I don't have much enthusiasm for picking up my laptop even if it's to blog about my stitching. Thanks for understanding! Hope your summer is off to a wonderful start! Have a great week ahead! Catherine of Aragon arrived at my house this week. How often can you say that? 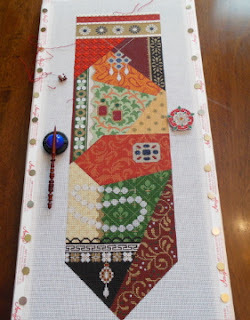 Catherine is actually the theme for the second kit in the Tudors Home Study by Amy Bunger. Catherine brought her jeweled necklace for application to the canvas. My first step was to glue the "sapphires" to the canvas. Once they had dried completely, I began the basketweave area using a burgundy Impressions. We will apply a blackwork design on top of this basketweave area. 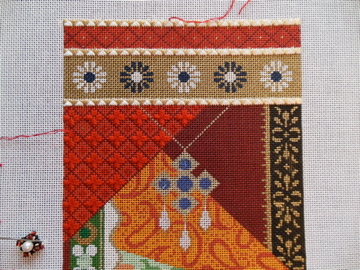 The other two areas we'll focus on in this kit are the orange paisley section and the black and gold patterned border. I probably should mention that the photo is upside down but we are also stitching this section of the canvas upside down. Much easier than reaching the length of the canvas to stitch if it were right side up. 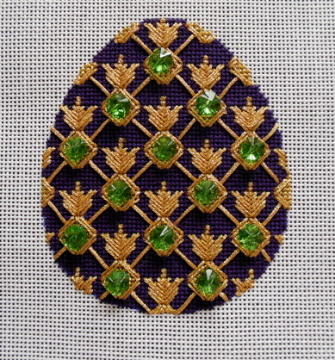 As I had hoped, I finished the purple egg with the green gems this week. 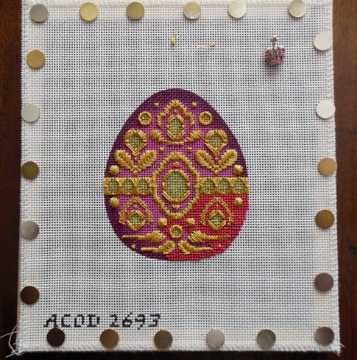 It's another beautiful egg and I love the richness of the deep purple which is set off by the gold threads and green gems. Egg #9 which is the pink egg with the turquoise gems is on the stretcher bars and ready to receive some attention today. I spent an enjoyable hour out on the patio last night after dark. There was a nice breeze and the temperature was perfect. What was most enjoyable was that there were no mosquitoes! I know it won't be long before they drive me inside so I will enjoy the evening hours outside while I still can. Hope you have a great first week of June ahead! I haven't been around the blog much the last couple of weeks but there has been a little bit of stitching going on in the evenings when work hasn't left me mentally and physically drained. The busy season for my work has arrived with a vengeance this year. I was distracted last week by Dan Brown's new book, Inferno. It was an enjoyable and a very fast-paced read - so much so that I got very little stitching done last week. Now that I have read it for the plot, I may go back and read it again for the fascinating in depth descriptions of the sights of Florence and Istanbul. On the needlepoint front, I finished Laura J. Perin's Bargello Egg. This was a fun project! 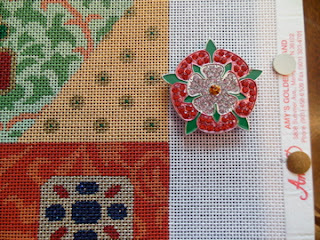 The Tudors Home Study project is moving along with only the red silk band to stitch to complete the first kit. Can't wait to see what Amy has in store for us in the second kit. My eighth egg in the From Russia with Love club is languishing in my stitching bag only because I am stitching dark purple thread on a purple canvas. It's almost as bad as stitching black on black even though it is only basketweave. This is the first time the next egg in the club has arrived with my not having finished the one before it. Maybe I can show you a finished egg next week. There's lots of good stitching time to be had today in front of the television beginning with the Formula One Monaco Gran Prix this morning followed by the Indy race and NASCAR later in the day. I hope you are having a relaxing Memorial Day weekend. We are having a picture perfect, temperature perfect weekend here in Georgia. Wish I could move the television outside! 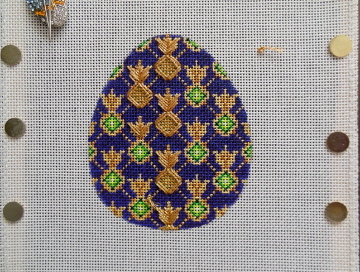 I can't tell you how excited I was this past week to receive my four finished From Russia with Love eggs from The Needle House especially after the week before it seemed that they hadn't even started them. The eggs are expertly finished! Each one is like a beautifully wrapped package. The fabrics, trims, and ribbons have been carefully selected to coordinate perfectly with each egg. The side views are as lovely as the front views. I think I will keep these out for awhile as they really are too pretty to put away! My work this week left me too tired to stitch most evenings but a burst of energy Wednesday evening and some quality stitching time on Saturday helped me make some nice progress on The Tudors. The red triangular shaped area and the red strip at the top are a six-step stitch pattern. Yesterday I finished Step 5 of the 6 steps. 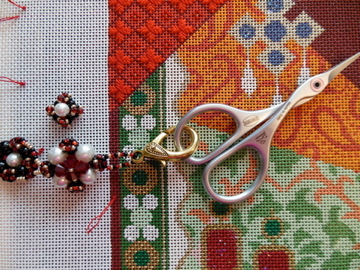 This is the beading step and I always enjoy beading. Not the greatest picture today but the camera and the computer didn't seem to want to cooperate today. It's much prettier than this picture would indicate! Last week I promised that I would show you one of the canvases I ordered from Amy during the January market. In this group photo on the left is Melissa Shirley's cat canvas. She offers this silhouette in several designs. I chose this one because of the other two Melissa Shirley canvases that I have. Last year I bought the Whimsy canvas along with the threads and stitch guide from Bestitched. Then I saw a companion piece in the Bloom canvas. My thought is that with the stitch guide for Whimsy I have lots of ideas and threads that I can use when it comes to stitching the Bloom and cat canvases. Now, I just need to find time to put Whimsy into the stitching rotation. It has been a cool, gloomy, rainy week here in Georgia. I'm hoping for warmer weather and sunshine in the upcoming week. I'm heading to Jacksonville for the Mother's Day weekend. I can't believe I haven't been there since Christmas! Can't wait to see Andrew and Anna! I'll take this opportunity to wish my stitching friends who are Moms a Happy Mother's Day and hope that you are able to spend it with your family and friends. I'll be back in a couple of weeks but until then have a great week ahead! What a heartbreaking week this has been! So much sorrow for lives that have been lost and for those lives that changed forever in just seconds. It certainly brings perspective to the minor problems and inconveniences in our own lives. Most of us aren't faced with the sudden death of a loved one or the loss of an arm or a leg or other life threatening injuries as a result of the actions of radical religious fanatics. Let's stop for a moment and offer up prayers for all of those affected by the events of this past week. I thoroughly enjoyed my Masters golf weekend last week and no one could have asked for a more exciting finish! Laura J. Perin's Bargello Egg was the perfect project for a weekend planned around watching golf on television. 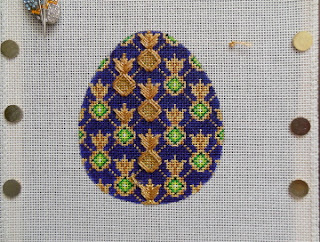 I completed the bottom half of the egg and am ready to move on to the top half. 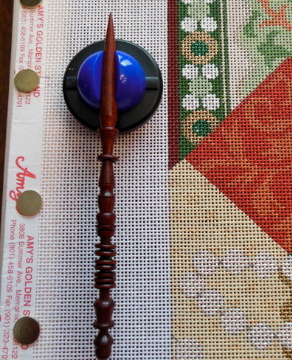 It has been a pleasant change of pace to stitch with perle cotton and not have to worry about plying the threads and laying them with a laying tool. Egg #8 in the From Russia with Love club arrived this week. This one looks as if it will be another quick stitch. The colors are so rich - a royal purple background, gold work, and emerald green crystals for the flowers. Another beauty! I have loved everything about this club as I have told you so many times but I was a little taken aback this week when I found out that the egg canvases I sent for finishing to The Needle House in January had not even been started. That was an unpleasant surprise to say the least! I hope the finishing makes them worth the wait. I'm looking forward to the arrival this week of the first kit from Amy Bunger's new Home Study - Royal Pain in the Tudors. I think a few of the things I ordered from the January market will be in the box as well. My UPS driver and USPS mail carrier have no idea how much I look forward to seeing either one of them this week! I can't wait to show you what arrives this week!